Everyone knows that My Mouth Is a Volcano! is a gem of a book. It worked in perfectly to 2nd grade’s friendship and social skills theme; good listening is an important skill! We started off with an activity from Julia Cook’s activity book for the story – the most worthwhile activity from any of the activity books if truth be told. 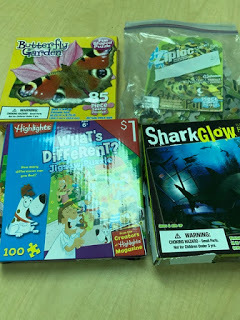 Students were put in small groups, given (dollar store) puzzles, and told they were in a competition to see which group could complete their puzzles the fastest. Because these kiddos haven’t mastered teamwork, sharing, or taking turns yet, we spent a few minutes reminding them of the expectations. Then we set them loose…and interrupted them…a lot. Turned the lights off, made an “important announcement” (that we like cheese), switched group members, etc. We were pleasantly surprised at how quickly they caught on to our aim. Note: make sure to use puzzles there is no chance of them completing in the time given – some of these kiddos are super good at puzzles! pg. 11 Was it really his volcano’s fault? Whose fault was it? pg. 13 Is that something he needed to say out loud right now? Why or why not? ***I don’t love the book’s tool for not interrupting – all the breathing is confusing. 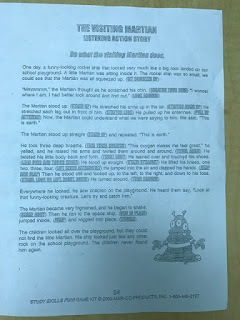 I read it to the students and tell them to close their mouth hard, swallow their words, and take a deep breath. This seems much clearer/simpler for them. One applied practice activity was to do a couple listening action stories. 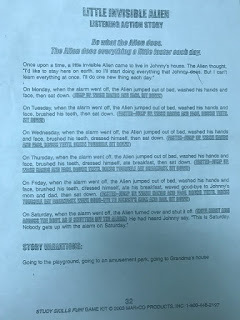 These are short stories read aloud that include several verbs and action phrases that students are meant to act along with. Catching them all requires listening, concentration, and a lack of interruptions. The goal was to challenge the students both in their attention to the activity but also in their not interrupting one another through laughter, talking, or losing self-control. I pulled these out of an old Marco products book from my office. The students enjoyed doing these but I’ll admit they were more about listening and following directions than making sure not to interrupt.